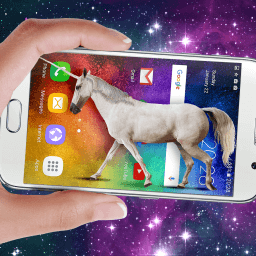 Install “Unicorn on screen: Neighing joke” and a white, mystic unicorn will start walking on the screen of your phone. Simulation of this legendary creature was prepared very carefully. The animal moves in a very natural way. Horn in the middle of the forehead looks very realistic and the creature itself makes frightening sounds. Everybody who will see this entertainment application will be shocked and will want to have the same one. Virtual unicorn will always be displayed over all applications in your phone. You can play games, browse the Internet, watch films and the animal will always be with you. We also give you possibility of setting size of this fantastic horned horse, choosing edge, which it will walk on and setting the time after which the mythical one-horned creature will appear on the screen. Novelty! You can also control unicorn by using your smartwatch. Press button on your phone and the creature will appear on the phone. Disclaimer : If you want to use wearable app you need to install phone app as well. App for watches will not work without phone app.